Baby Shower Bookmark Favors make classic and adorable baby shower favors ideas to surprise your guests. Choose from cute pink or blue baby and bear designs, or classic butterfly, leaf and holiday snowflake designs perfect for Summer, Fall and Holiday Baby Shower celebrations. Besides being great for seasonal and holiday baby showers, (more seasonal theme ideas on our Unique Baby Shower Themes page), these baby shower bookmark favors make great take home gifts for your guests ... and unique baby shower favors ideas for The Baby Book Shower. Gather up your favorite childhood books! Blue and Pink Baby and Teddy Bear Bookmark Favors are great for a parent-to-be, or perfect for children's books. Use the Teddy Bear bookmark for The Teddy Bear Baby Shower favors. Having A Spring, Summer Or Fall Baby Shower? The Butterfly for Spring or Summer and the "Turning Leaves" bookmarks for Fall are perfect. Add a little bookworm class to your baby shower. Having a Holiday Baby Shower? What a great time of year to celebrate the arrival of the new baby. The Silver Plated Snowflake Bookmark is elegant and functional. It also makes a beautiful Christmas ornament. Visit our friends at Creative Personalized Keepsakes. Baby shower bookmark favors are a fun accent to the favors you'll give to your baby shower guests or they can even be used as birth announcements. Whether it's "Pretty In Pink" or Pink Gingham, very cute ideas just for the girls! 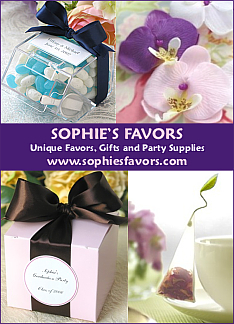 Personalized favor ribbon and gift bows ... learn how to add a professional look!